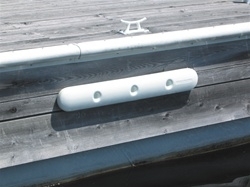 Manufactured from high-quality marine grade vinyl resulting in superior strength and cushioning, the UltraGuard offers 35'' of ultimate dock protection from boat impacts. Designed with molded in ribs on the interior to ensure the UltraGuard will not collapse, while the back portion has slight radius to allow the UltraGuard to be easily mounted on pilings as well. Length: 35''. Imported.